I have spent the last three decades developing my love of fishing and the last 20 years running charters out of Quepos, Costa Rica. Fishing with me this will quickly become apparent as well as my desire to share these feelings with you. Catering from Marthas Vineyard to Costa Rica everything from bottom fishing to fishing for giant tuna and marlin with everything from light tackle, fly gear to heavy tackle I have done it all for family or tournaments. We are looking forward to fishing in Quepos, Costa Rica with you. After you’ve caught you’re share of Costa Rica’s pelagic bounty on conventional tackle with the Big Eye team, consider mastering Sailfish “on the fly” with them. There’s nothing like the thrill of being connected to a “grey hounding” Sailfish with a fly rod. Franklin is one of the few Captains in Costa Rica that understand the equipment, choreography and skills needed to join this elite club, and he can teach you how to do it. 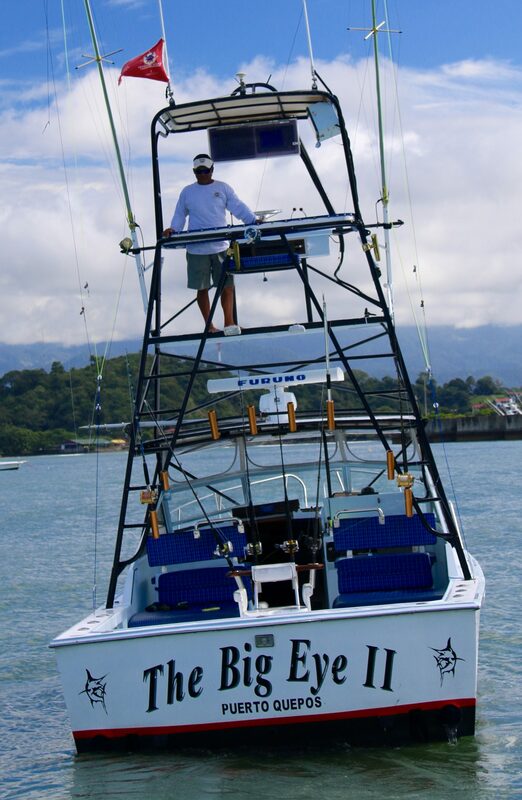 Captain Franklin Araya Martinez, a Costa Rican Captain, is found at the helm of the Big Eye II. 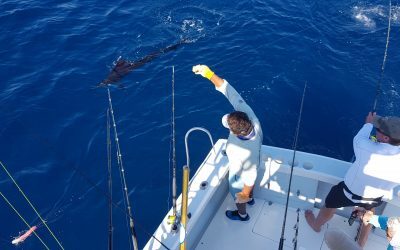 Whether it is chasing big Pacific sailfish, marlin, dorado, tuna, roosterfish, jacks, grouper or snapper, Captain Franklin will provide his experience and expertise with Quepos Fishing Charters. Franklin is our Fly Fishing expert. You will enjoy the thrill as Franklin teases the giant sailfish behind the boat and you see your favorite fly attacked. Hang on and enjoy the show. Captain Franklin has fished out of Quepos, Drake Bay, Golfito, Canada, Martha’s Vineyard. Quepos/ Manuel antonio is home for Captain Franklin and his family. The Big Eye II is a 32′ Blackwatch with extra shade for your comfort. As a result, will appreciate the comfortable seating as you relax and wait on the big one to bite. The Big Eye II has a cruising speed of about 21 knots. We usually have plenty of sailfish action offshore on the full day trips and it is also very common to catch tuna, mahi mahi and marlin. 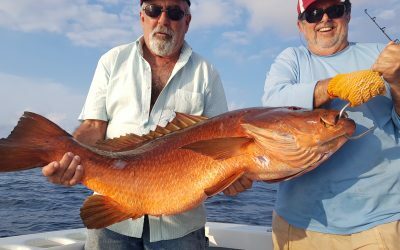 The full day charter is the best option for serious anglers. Sailfish action is usually good on the 3/4 day trip with other fish occasionally. We target the popular Rooster fish on the half day trips and sometimes catch snapper, mackerel and jacks on these trips. The key to catching rooster fish is finding good live bait. This takes time and patience but the reward can be great.